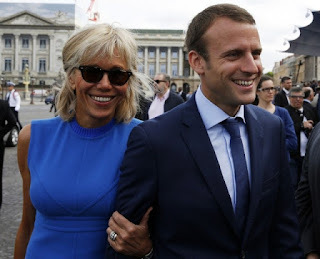 The forthcoming transparency charter, expected within the next few days, will most likely provide official detail on the current makeup of Brigitte Macron’s staff. She currently has three assistants at her disposal, including two presidential attachés (communications director Pierre-Olivier Costa and Tristan Brome, her chief of staff) and a secretary. That’s fewer than her past three predecessors. Valérie Trierweiler, the former partner of François Hollande, had five assistants; Nicholas Sarkozy’s wife, Carla Bruni, had eight; and Bernadette Chirac, wife of former French president Jaques Chirac, had a staff of twenty people at her disposal. Brigitte Macron, a former schoolteacher, plans to become deeply involved in issues surrounding education and disabilities.